There are three compartments to the human ovary. The Follicle compartment is the structure that enlarges each month forming a small cyst or follicle. As it does, it releases primarily estrogen. When the follicle ruptures, releasing the egg, the small ruptured cyst (the follicle) collapses forming a small crater called the Corpus Luteum. This crater wall thickens and becomes another compartment which produces progesterone. These two compartments slow down and eventually stop at menopause. Fertility ends. 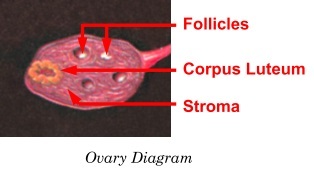 The third compartment which is greatly overlooked is the Ovarian Stroma. It looks as if it is merely fibrous tissue holding all of the follicles together. In fact, it is the source of the androgens, the primary one being testosterone (the forgotten female hormone). This vital structure continues to secrete testosterone for the rest of the woman’s life or until it is removed. Even after the ovary has stopped releasing eggs, this compartment continues to work. The post-menopausal ovary, though much smaller in size, remains a valuable endocrine organ. Pregnancy and childbirth change hormone production in ways that nature designed in order to preserve our species. Some of the change isn’t necessarily good. For this reason, women are so much more vulnerable to hormone decline than men. The secretion of hormones from the three compartments of the ovary is altered during pregnancy as the placenta of pregnancy takes over hormone production temporarily. When the pregnancy and breast feeding time are over, the ovary tries to return to its previous function, but, sometimes the Ovarian Stroma (testosterone producing compartment) doesn’t work as well as it did before pregnancy began. This is especially true after several pregnancies. The woman continues to feel tired, irritable, depressed, and have a diminished libido. She thinks it is all due to new baby responsibilities, child-rearing stress, and requirements on her in general…just a very busy life. Actually, the cause is a diminished testosterone level in her body. The Ovarian Stroma compartment has not returned to normal. Even without pregnancies, this valuable ovarian compartment progressively declines in production and symptoms begin to occur. Natural human hormones are manufactured by a biochemist in a chemical laboratory or drug company. The biochemist extracts the base molecule from soybeans or yams, then adds the necessary carbon, oxygen, and hydrogen atoms to the base molecule. The resulting molecule is bio-identical to the human molecule (as pictured in biochemistry textbooks). The hormones produced in this manner are exactly like the same hormones present in the human body and already created by nature.